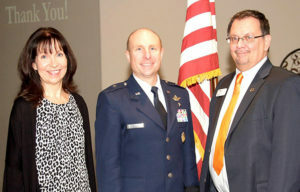 Lisa Kinison of Aerotech News and Review and Allen Hoffman, Boeing site manager, sponsored the November Antelope Valley Board of Trade luncheon featuring guest speaker, Brig. 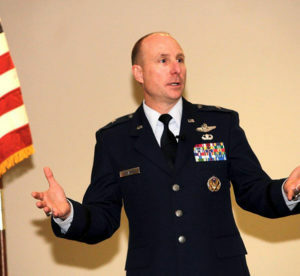 Gen. Carl E. Schaefer, commander of the 412th Test Wing at Edwards Air Force Base. Aerotech News and Review, and Boeing sponsored the November Antelope Valley Board of Trade luncheon featuring guest speaker, Brig. 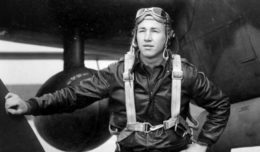 Gen. Carl E. Schaefer, commander of the 412th Test Wing at Edwards Air Force Base. Honored to be a speaker and feeling right at home, Schaefer said he was thankful for the amazing community that supports Edwards. “What a blessing, a lot of bases don’t have the community support that we have. 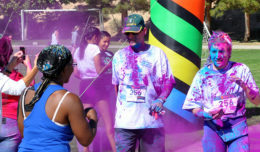 Edwards has the best support of any base in the Air Force.” This is his third tour at Edwards. Employing more than 12,000 personnel, Edwards is the second largest base in the U.S. Air Force with a $1.5 billion annual economic impact in the region. Additionally Air Force Plant 42 in Palmdale provides $4 billion. Edwards supports three areas of the Air Force’s mission: Global vigilance — using U-2s, Global Hawks and other unmanned aircraft that gather intelligence, reconnaissance and surveillance, delivering that timely information to both military and civilian leaders; Global power — using F-35, F-22 and F-16 fighter jets. “We can hold any target at risk-24 hours a day; that’s power,” explained Schaefer. Global reach — being able to take equipment and move it where it is needed around the world-using C-17s, C-5s and the new KC-46 tanker program. He said that the F-35 and KC-46 are currently the busiest programs in the Air Force. Partnering with Lockheed Martin and NASA, the F-16 fleet has upgraded its automatic ground collision avoidance system which automatically maneuvers the aircraft when it senses an impending collision. Brig. Gen. Carl E. Schaefer, commander of the 412th Test Wing, shares the future of Edwards. He said Edwards and Plant 42 have a bright future, but just how bright, depends on Congress. “Think about God taking over your F-16 if you’re about to plow into the ground,” said Schaefer. “We never had a system like that before.” The system has been used twice in Afghanistan and once within the United States saving the jets and crew members. With the majority of the aircraft being 25 years or older, constant upgrades are necessary. Comparing jets to a 25 year old car, Schaefer said there comes a point where it is cheaper and makes more sense to buy a new product than continually upgrading. “If the secretary and chief of staff continue on their 10- to 15-year plan, we’re going to capitalize on that.” Schaefer said the future of Edwards looks bright, but just how bright depends on Congress. Thirty years ago Paul Kinison started the “Antelope Valley Aerospace” newspaper because no other media was providing targeted coverage of the aerospace industry in the High Desert. The ‘mom and pop’ company now employs 35 people in six states and publishes several military base newspapers in California, Nevada and Arizona. As a service to the community, the free publications with the “aerospace niche” often have articles from organizations such as Civ Mil, Antelope Valley Board of Trade, Flight Test Historical Foundation, local schools and other Department of Defense publications around the world. It can also be viewed and shared on line for free, flipping pages like an actual paper. Boeing is also evolving to keep up with the times. 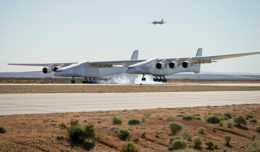 “Our business is a little different than it used to be,” said Allen Hoffman, past AVBOT president and Boeing site manager for Edwards AFB and the NASA Armstrong Flight Research Center. As a major service provider to NASA, Boeing is the prime contractor for the International Space Station and one of the largest U.S. exporters in terms of sales — they are now branching out into cyber security. Employing more than 165,000 people across the United States and in 65 countries, Hoffman said the company revenues for 2014 were a record $90.8 billion, often testing aircraft at Edwards and at Plant 42 in Palmdale.